London Rocket is a member of the Mustard Family. The plant grows to 3 feet in height and has dark green, large, fleshy leaves that grow to 8 inches in length. The plant typically grows along roadsides and in fields at elevations between 100 - 4500 feet. London Rocket was introduced to the area from Europe. London Rocket blooms between December - April and produces clusters of yellow flowers with 4 petals which form at the top of a stalk. 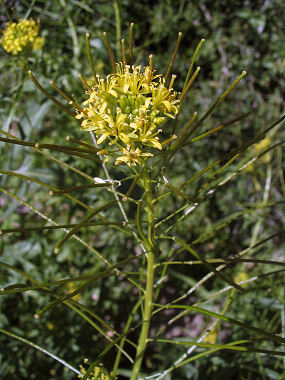 Flowers are followed by a long, narrow, mustard-like seed pod to 2 inches in length.